Welcome to Rodney Wayne Albany hair salon and hairdresser. Winner of the Rodney Wayne Salon of the Year 2016! You’ll find the friendly team of hairdressing experts at Rodney Wayne Albany hair salon can provide inspiration for a beautiful haircut, hairstyle or hairdo for you. And we offer a no-obligation free consultation so you know exactly what is involved beforehand. We believe everyone is uniquely beautiful. So we are dedicated to creating a look that’s right for you as well as your lifestyle. Our teams are expertly trained to enhance the natural beauty of your hair without compromising the integrity of your hair. You’ll find a comprehensive range of services including hairstyles, haircuts, trims, and permanent and semipermanent colouring. We also offer balayage colouring, blow-dry, straightening and curling with ghd hot irons and a range of hair treatments. We service a range of hair types including straight hair, curly hair, long hair, medium hair and short hair in all hair colours including blonde hair, brown hair dark hair and black hair. Our award-winning stylists and colourists are at the forefront of hairdressing fashion and trends, with their creativity receiving local and international acclaim. You can catch up with their latest tips and trends by following us on Facebook, Instagram or Pinterest. Or simply pop into the salon and ask. At Rodney Wayne Albany hair salon, we believe the health of your hair is key to the way it looks and feels. 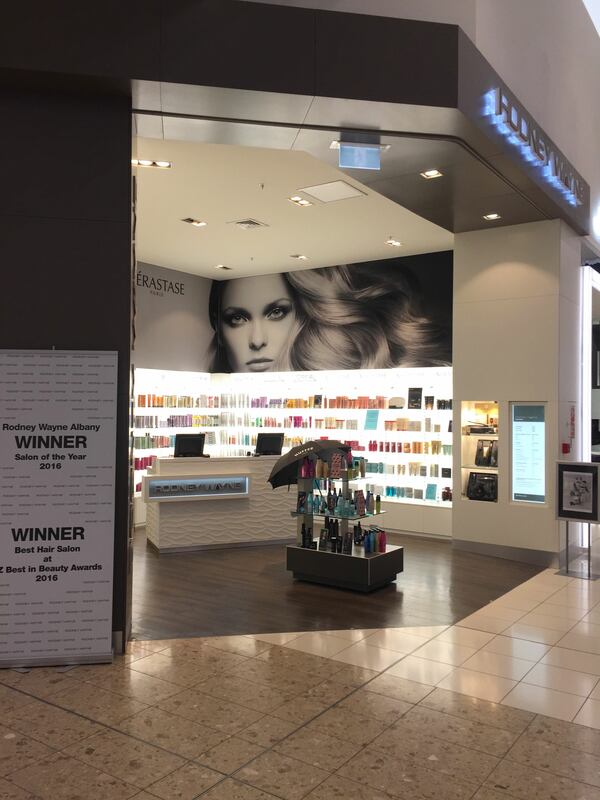 We use and recommend Kérastase and L’Oréal Professionel products and the team at Rodney Wayne Albany is expertly trained to advise you on which shampoo, conditioner, treatments and hair care products are best for you. So you can look after your hair long after you leave the salon. Every time you buy a product or service at Rodney Wayne you can earn Rodney Wayne Rewards*. They can go towards services and products at both Rodney Wayne salons and Rodney Wayne Shampoo ‘n’ Things. You also get access to extra special offers and exclusive products. Simply provide your name, phone number and email address next time you visit and you are on your way to looking and feeling even more fabulous. So call or book online today for a beautiful hair colour or cut delivered by a friendly team of hair professionals. *Rodney Wayne Rewards Terms and Conditions apply.